You'll get your stake back in cash! A lot of British Bookmakers offer some form of ACCA insurance, but Betfair have gone one step further with the launch of 'ACCA Edge' - as theirs offers members moneyback in cash! Instead of getting your stake returned as a free bet if an ACCA loses by 1 leg, much like 888sport's ACCA Saver, Betfair actually refund your losing bet in cold hard cash. So what exactly is ACCA Edge and how does it work? To put it simply, if you place an ACCA of 3 or more selections and one leg causes you to lose, you'll get your stake refunded. Obviously you'll need to be a member of Betfair in order to be able to use ACCA Edge. Make sure you check out the latest Betfair signup offer if you aren't an account holder. Login to your account at Betfair.com or via their App. Compile an ACCA of 3 selections or more. Eligible bets will be highlighted by an 'Edge' icon. Odds recalculate once you apply ACCA Edge. Place the bet with ACCA Edge applied. Get refunded in cash if one leg doesn't win! This is one of the best ACCA promotions out of all of the online bookmakers that we currently feature, and one that you really must look into if you regularly place accumulator bets. Click here to visit Betfair's website to find out how you could get moneyback on a losing ACCA. Betfair issue refunds in cash, not bonus bets. Refunds received straight away, not the next day. Applies to Trebles and above, not 5-Fold's+. ACCA Edge available on ALL sports markets. There's no maximum refund amount. No minimum odds that ACCA's must adhere to. 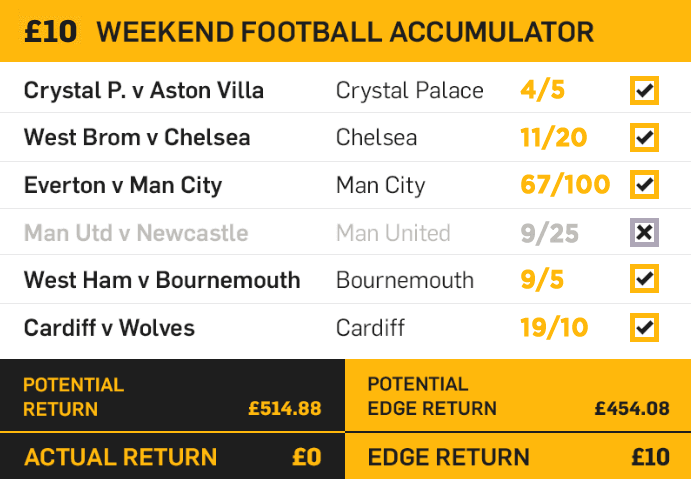 As you can see from the above list, Betfair ACCA Edge really is one of the best forms of ACCA insurance, and something that most punters needs to take advantage of at least once. The fact that Betfair issue refunds in cash and not bonus bets, is reason alone! The other betting offer that they've got surrounding accumulator bets is Betfair ACCA Boost which gives members boosted winnings on the first ACCA that you place each week. You can probably tell that we're big fans of Betfair's ACCA Edge here at British Bookmakers. To further explain why we think it's so good, we've put together the following example bet. It shows the potential returns of a 6-fold ACCA with and without ACCA Edge applied. As you can see from the ACCA Edge example above, you wouldn’t receive anything with a normal bet despite correctly predicting 5 out of the 6 selections. However if you'd applied Betfair ACCA Edge to the bet, you'd at least get your stake back in cash, giving you the option to withdraw it, or place another bet. So although your potential return is slightly reduced when using Betfair's form of ACCA insurance, so are your chances of walking away with absolutely nothing! Only available on fixed odds betting markets. Not available for EW, SP or permutation multiples. ACCA Edge removed if bet's contain void selection. Bets placed with ACCA Edge can be Cashed Out. ACCA Edge voided if you use Cash Out. Odds with ACCA Edge applied will be slightly lower. Full terms and conditions for this ACCA Edge betting offer can be found on Betfair.com. Despite a few limitations, Betfair's ACCA offer is one of the best ACCA promotions going for the simple reason that you get cash back, instead of bonus bets if one leg lets you down. 1. Applies to Sportsbook (fixed odds) accumulator bets only. 2. Not available for each-way accumulators, SP accumulators, bets placed with free bet tokens or permutation multiples (Yankee, Lucky 15 etc.). 3. Stakes are returned as cash. 4. Betfair ACCA Edge must be ticked at the time of bet placement and you must receive confirmation from Betfair that it has been ‘applied’. 5. You acknowledge that the odds with Betfair ACCA Edge may be different from the odds of the bet without Betfair ACCA Edge. 6. Betfair ACCA Edge will become void if any leg is settled void or any leg is subject to a Dead Heat Reduction. In such circumstances the bet will revert to a normal accumulator bet without Betfair ACCA Edge and be priced based on the original leg prices taken at bet placement. 7. Bets placed with ACCA Edge are available for Cash Out, however any Cash Out (partial or full) will render ACCA Edge void. 8. Betfair reserves the right to suspend or disable the Betfair ACCA Edge feature at any time. As with all of Betfair's betting offers, you'll need to previously have signed up as a customer at Betfair.com to take advantage of ACCA Edge when placing accumulator bets. If you aren't a member at one of Britains most progressive bookmakers, then great, as you'll also be able to claim the signup offer that Betfair reward new account holders with.